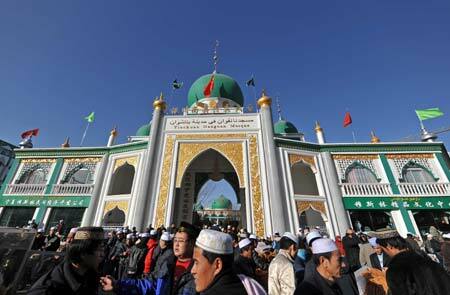 Millions of Muslims across China celebrated their annual Corban Festival Tuesday. Mosques in northwestern Xinjiang Uygur Autonomous Region and Ningxia Hui Autonomous Region, two major Muslim communities, were packed with people chanting and singing religious sutras. "I'm praying for a more beautiful life in the coming year," said Tawargul, a middle-aged Uygur woman who was among tens of thousands of Muslims gathered at the Id Kah Mosque in Xinjiang's Kashi City. "I've already prepared plenty of food for the festival: mutton, cakes, pears and apples," she said. After the religious rite was completed, Tawargul went home to entertain relatives and friends. Bazaars, in the Xinjiang regional capital Urumqi, were also crowded with Muslims selecting foods and costumes. Corban Festival, also known as Id al-Gurban, is a major Islamic festival showing faith and obedience to Allah. People slay livestock and divide it into three parts. One part is for the family, one for relatives and friends and the rest goes to charity. "If a family doesn't raise livestock, they will buy some mutton. It's tradition," said 28-year-old peddler Ma Lutui, a man of the Hui ethnic group from northwestern Gansu Province. He sells Muslim snacks in the Ningxia regional capital of Yinchuan together with his wife. "It's also an important occasion for family reunion, so we have asked my parents to come here from their hometown to celebrate with us," Ma said. China has more than 20 million Muslims, mainly living in Xinjiang, Ningxia, Gansu, Qinghai, Yunnan, Shaanxi, Inner Mongolia and Henan. In Beijing, the Islamic Association of China (IAC) held a reception on Monday to mark the festival. IAC President Chen Guangyuan sent good wishes to Muslims. He said the IAC organized about 11,800 Muslims in the country to go to Mecca for pilgrimage this year. The number is 1,000 more than that of last year.